There's not much more I can say about Cara Stewart records. I love them. She has only a few templates, but as with Fats Domino, who also worked with a fairly specific and small palette, they're pretty much all wonderful templates, capable of resulting in some really nice records. Such is the case with "Signal Lights", a nice, mid-tempo shuffle, with male back-up singers, a bouncy band and a unimpeachable vocal. The Top Rock label may have been the vanity project, via Lee Hudson's song-poem factory, of someone named Les Hilton. 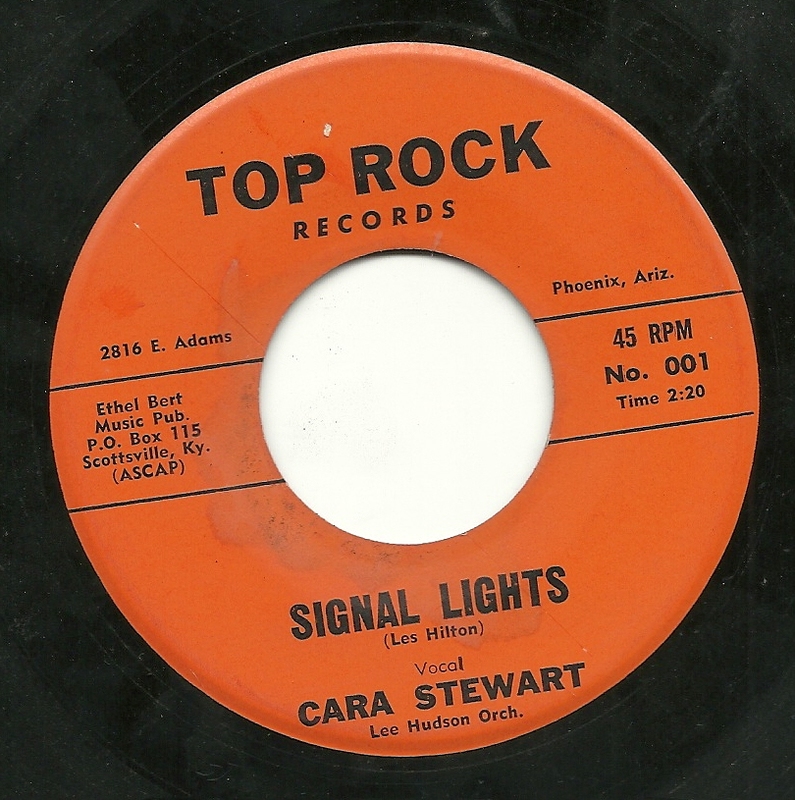 It's hard to say, because this is the only record on the label where the AS/PMA website lists the songwriter (interestingly, that page shows a co-writer for the flip side, a name which does not appear on my copy).But my guess is, Les Hilton was the song-writer, or co-writer, on all "Top Rock" releases. 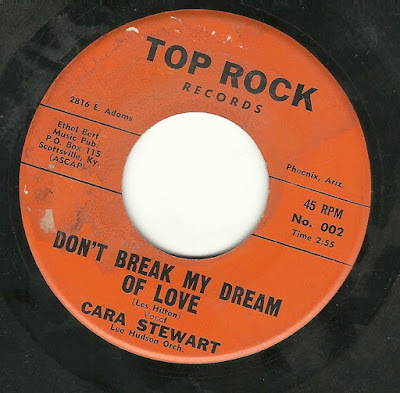 Also, if you do a search for either of today's records and for Cara Stewart's name, you'll find google books results for both an ad in Billboard for this record, and a listing in a different issue of Billboard where they indicate it has "limited potential". "Please take my lips, abuse them, to your desire." Cleverer Than the Av-Er-Age Song Poet! When listening to a stack of song-poems, the majority of which, I assure you, are wholly uninspired both lyrically and musically, it's nice to come across something unexpected. One of the nicer things to stumble upon is a song for which the song-poet tried to write something creative and a little bit clever. 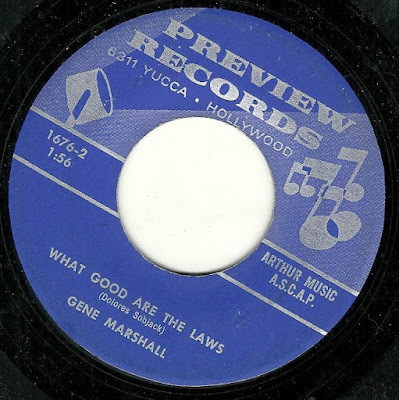 The flip side, "What Good Are the Laws?" is, as the title suggests, a complaint against some of the many things that are wrong in the world, and just as enjoyable as that description suggests, despite another warm, winning vocal from Gene Marshall. Download: Gene Marshall - What Good Are the Laws? 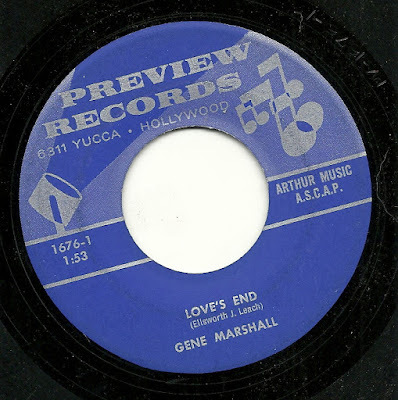 Last week, I wrote, regarding an particularly odd record called "Lonesome Sad and Blue", that one of the reasons the record resonated with me is because a good part of the melody strongly resembled that of the lovely song "Spanish is the Loving Tongue". Frequent commenter Timmy went even further, suggesting that litigation would not have been out of the question. But that thievery pales in comparison to today's masterwork, a record I find nothing short of astonishing. Someone named Elbert Ward decided to take it upon himself to write out the words to Mel Tillis' "Ruby (Don't Take Your Love to Town)", and send them, almost verbatim, to the good folks at Tin Pan Alley records. Mr. Ward changed a few words here and there - my guess is that this was done to somehow make him think that he "wrote" these words, but it's also possible that he was simply hearing the original words incorrectly. Regardless of the reason, the changes make virtually no difference in the overall direction, meaning and story of the song. This is the third time I've come across this phenomenon. First, it was a "lyricist" who simply submitted the words to the chestnut "Nobody's Child", and then it was the genius who took the lyrics to the classic (sic) "Watching Bobby Grow" and changed the name of the child to that of the "lyricist's" own child. This one seems more egregious to me, because the original of this one is a more familiar song and also a better song, certainly better than "Watching Scotty Grow". I have to wonder what Mr. Ward thought he was accomplishing. Did he think getting his name on the label meant he actually wrote Mel Tillis' song? The only thing original that was going to come out of this transaction - which he would have paid handsomely for - is the music, a portion of the collaboration he had no part in. And my guess is that anyone who heard the record of "his" song, would say, "hey, YOU DIDN'T WRITE THOSE WORDS". 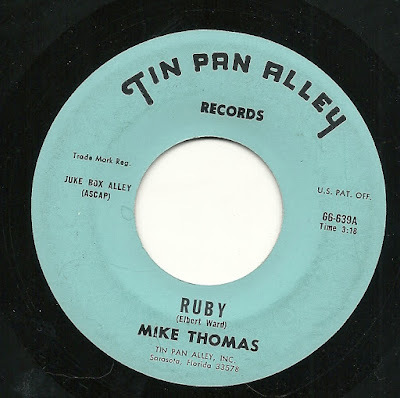 Speaking of the music, though - the folks at Tin Pan Alley seem to have had a ball with this one, perhaps (speculation, of course) because they likely knew it was a rip-off, within the rip-off that it already was. There is a bluesy, garage band feel to this one, and nothing is left on the table. The solo, while not technically very good, is energetic, and, to my ears, exciting. Mike Thomas is fairly "eh", but that's to be expected. On the other side is more fun from Elbert Ward. Perhaps (speculation, of course) learning that there was a song called "Stairway to Heaven" (maybe you've heard of it), and perhaps listening to it and finding out, to his eternal disappointment, that it was not a religious number per se, perhaps he decided that the title concept was an excellent idea, but that the trip needed to be a somewhat faster one. Voila! 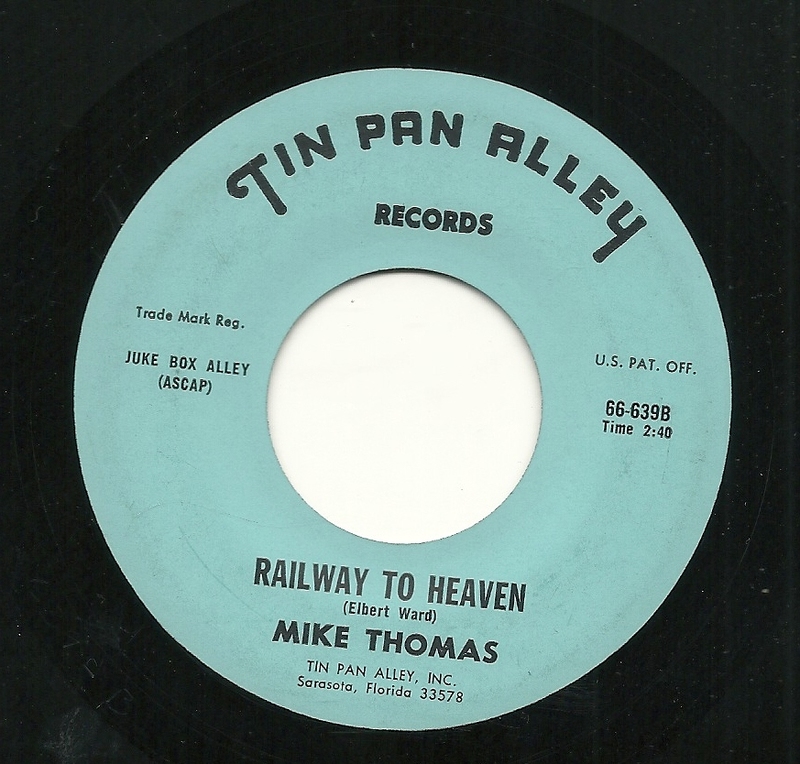 A "RAILWAY TO HEAVEN"! And then, as you'll hear, he threw in a bunch of New Testament references, not really tied together all that well. Or at all. But you know how it is.